The Central Bank annual report for last year, states that the number of mobile phone connections has increased to 20.3 million. 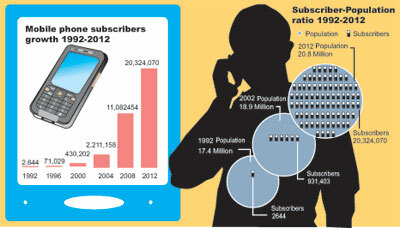 In 2011, that number stood at 18 million, while in 1992 when the population was 17.4 million there were only 2,644 mobile subscribers. Prof. Dileeka Dias of Moratuwa University Department of Electronics and Telecommunications said this development would bridge the digital divide between the urban and rural communities in the country. “Mobiles are more affordable than computers and with broadband service expanding; the internet is available to more and more people. Also, a mobile phone is a great aid to upcoming small and medium businesses,” she said. The Central Bank report said that international studies revealed that mobile penetration has had a significant impact on uplifting the living standards of the rural poor. Meanwhile the Sunday Times spoke to a cross section of mobile phone users to get their views.�All-Island Three-Wheeler Driver’s Association president Lalith Dharmasekare said that many three-wheeler drivers benefited from mobile connections. �“Mobile phones have contributed to raising our living standards. The ‘Budget Taxi’ concept which has revolutionised the three-wheeler industry is thriving because of the expansion of mobile phone usage and establishment of a call centre,” he said. Saman Padmasiri, a farmer from Kuliyapitiya in Kurunegala district said since he started using a mobile phone a year ago, he communicates with other farmers and purchasing stores to arrange timely transport of the harvest. 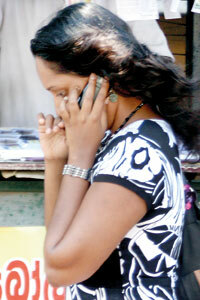 Mohommed Uvais, a Pettah businessman said mobile phones have helped businessmen to expand their businesses. But the usage of mobile phones also has its negative impacts. “Excessive use may result in reduced actual social interaction, especially among the present youth whose social skills are reducing with the excessive use,” Prof. Dias said. One such person is Shehan (26) * who’s happy to be on the phone throughout the day, even amidst friends and family. “My friends and family complain, but I can’t help it. I think that face-to-face conversations are uncomfortable and embarrassing. I’m a reserved person and this is a good excuse. I’m very active in social networking, instant messaging and video games,” he said. Ceylon Teacher’s Union president Joseph Stalin said a majority of students use mobile phones, sometimes leading to misuse.�“Parents need to be more responsible and should be aware of the facilities available on the phones. Though phones are prohibited in schools, students widely use them outside at classes and at home. Therefore it is important to educate them on the proper use,” he said. Prof. Dias meanwhile said some applications should be used with proper awareness on privacy settings and it was important to have some prior knowledge in security, especially before publishing personal details or photographs.�Meanwhile internet subscribers via mobile had increased to 942, 461 last year compared to 485,000 in 2011. But according to the Central Bank, at present the level of internet penetration is at a low level of 6.7 per cent. Telecommunication Regulatory Commission (TRC) Director General Anusha Pelpita said that According to the Telecommunication Regulatory Commission, the increase in mobile connections is due to persons possessing more than one subscriber identification module’s (SIM). The Central Bank report said the evolving technology posed challenges to the intensity of coverage due to capacity constraints arising from higher data requirements. “This necessitates the continuous deployment of new base stations,” the report said. Mr. Pelpita said that operators have been told to adopt passive sharing which includes sharing of infrastructure such as steel towers, ground space and power supply among operators. �He said although a majority of the users still have 2G he was hopeful that in another three-four years time 3G services would become popular and increase internet usage to 15-20 percent. But Prof. Dias said that the dearth of local language applications and content was one reason that the capabilities of 3G and 4G were not fully utilised.�“The low proliferation of smart phones can be also another reason,” she said.